Almost all of them are in great condition. I can take more in-depth photos upon request. The holos and rares are in protective plastic sleeves. Most of the cards are the original cards from 1999. There are a few Team Rocket ones included in this lot. Most cards are in good to great condition. What are included in this lot. Trainer Super Energy Removal (1999). Energy Cards (not pictures - all in great conditions). Assorted Japanese Cards (26) See pictures. 3x Diglet (2x Shadowless 1999). 1x Nidoran (Male - 1999). 2x Kakuna (2x 1999; 1x Shadowless). 2x Tangela (2x 1999; 1x Shadowless). 2x Koffing (2x 1999 Shadowless). 2x Ivysaur (2x 1999; 1x Shadowless). 2x Metapod (2x 1999 Shadowless). 2x Porygon (1x 1999 Shadowless). 2x Voltorb (2x 1999 - Shadowless). 2x Magmar (1x 1999 Shadowless). 3x Charmander (1x 1999; 2x Dark Charmander). 4x Gastly (4x 1999; 2x Shadowless). 2x Haunter (2x 1999; 1x Shadowless) NON-Holo. 2x Jynx (2x 1999; 1x Shadowless). 3x Abra (1x 1999; 1x Shadowless). 2x Poliwag (2x 1999; 2x Shadowless). 2x Magikarp (2x 1999; 1x Shadowless). 2x Psyduck (1x 1999; 1x Dark Psyduck). 3x Gust of Wing (1999). Anything labeled "dark" is from the Team Rocket edition I believe. I labelled the listing to the best of my abilities. Cards labeled 1999 are from the original pokemon cards (I believe). I can provide additional pictures upon request. Feel free to contact me for a additional photos if you wish. One of the holos and one of the rares has wrinkles. Very few of the common and uncommon may have some signs of wear or very minor wrinkles (maybe a total of 6-12 cards in the whole lot of 200 cards). INDIVIDUAL PICTURES OF EACH CARD IS AVAILABLE UPON REQUEST! Please read the listing of what are included and the condition. I can provide additional pics upon request. I will look at reasonable offers. 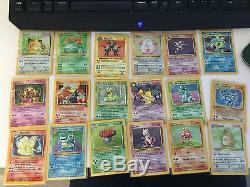 The item "Pokemon Cards 17 Holos, 19 Rares and 150+ others. Most from 1999 Collection" is in sale since Tuesday, August 30, 2016. This item is in the category "Toys & Hobbies\Collectible Card Games\Pokémon Trading Card Game\Pokémon Mixed Card Lots". The seller is "briangumbel" and is located in Saskatoon, Saskatchewan. This item can be shipped to Canada, United States.